During the past month, Venezuelan architect Ana Manzo @anammanzo hosted a series about harmony on her blog The Place of Dreams. Mine was the 14th post. Who knew that architects, designers, contractors, and related folks could find so much richness in one word? You can read the entire series here. My blogging friends defined harmony beautifully onAna’s blog. They found harmony in rock and roll, poetry, nature, relationships, ancient sacred ground, and architecture. Diverse elements cooperate into a completely new sound, different and more complex than the individual notes. Harmony is not a state or condition; it’s a perfect balance achieved by coordinating diversity. Through complexity, we find unity. Ana said harmony is love. I think that’s right. Love sees us and accepts us as we are. The Greeks agreed. They invented the word – harmonia – to mean joint agreement or accord. It’s compromise, joining, and fitting together. My question is: are we becoming more harmonious? 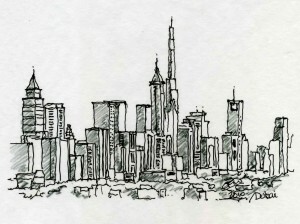 And how do we find harmony in cities? First, I want to add one more idea to harmony – rebellion. Are there times we prefer life beyond accord? Foucault fretted over harmony, which he saw as oppression, pressure to conform. That’s the rebel’s voice. I would call that pushing limits, testing the edges of conformity. In harmony, the notes desire each other, respect difference, and create a new sound, unlike any single note. They seek a community of notes, joining the most extreme, and all are transformed, transcendent, into a richer, more complex voice. We need single notes too. They come first, the ingredients of harmony. And the further they push, the more complex, varied, intriguing harmonies emerge. Individual notes must be celebrated. Sometimes I wantMonk. How does harmony work in architecture? Architects argue about harmony. 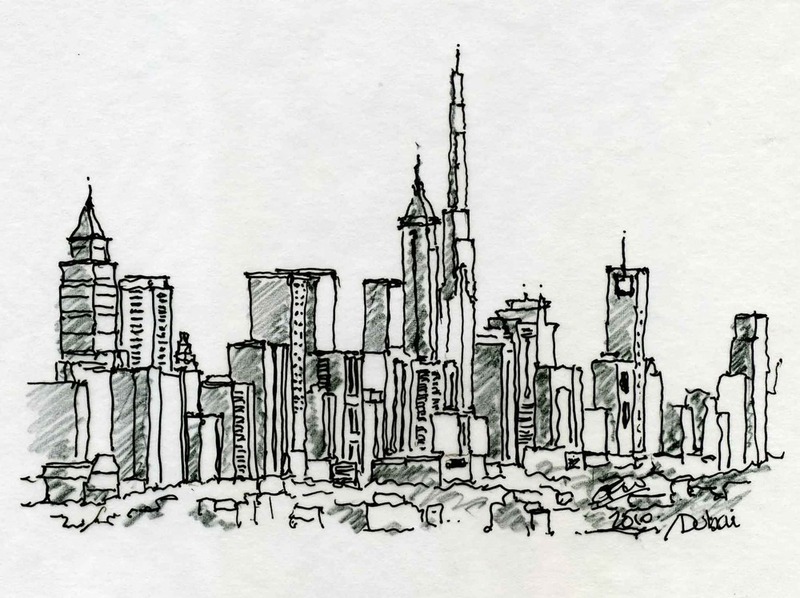 Christopher Alexander believes that great towns and cities blend the parts into the whole. “When you actually get all those elements correct, at a certain point you begin to feel that they are in harmony.” Peter Eisenman claims that disharmony and harmony exist in the cosmos; we need both. He fights for individual expression. Is it possible that these opposites are two sides of the same coin? These modern lions fight over the same terms. Disharmony and incongruity aim at order, as does harmony. Some choose to conform and others fight. That is a mindset, the either/or way of 20th century thinking. Here’s true harmony to me – both/and. 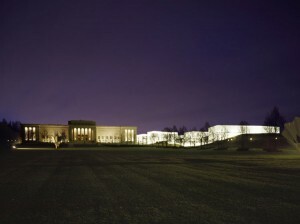 Both compatible buildings and buildings that contrast. Exceptions prove the rule. 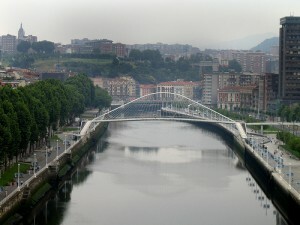 Are Bilbao’s historical buildings more memorable next to Calatrava’s Zubizuri footbridge? 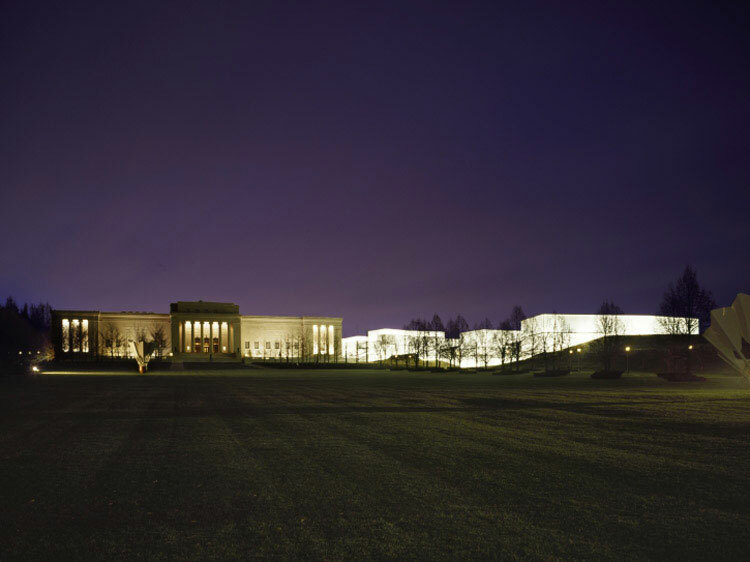 feel greater attraction to the Nelson-Atkins Museum thanks to Holl’s ultra-modern addition? 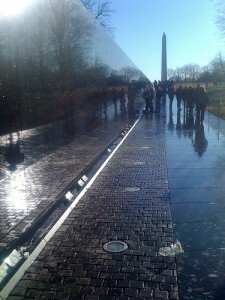 Vietnam Veterans’ Memorial open your eyes to the heroics of the neo-classical monuments? To me, that’s the role of harmony – to celebrate difference. And we still need powerful, single notes. Too much conformity, you get suburbs or Disney-fake, like a one-dimensional painting. Too much clashing, you get single notes competing, Las Vegas-style. If single voices are never heard, if remarkable buildings are never seen, the city goes flat. What is harmony in society? Harmony, you might say, begins inside of us and informs our relationship with the universe. It works through me to we, to things, to nature, to cosmos. Claire Graves invented a developmental model of humans, societies, even civilization calledSpiral Dynamics. The nine tiers of self-awareness (color -coded) ormemes move towards greater harmony and connectivity – instinctive (beige), animistic (purple), egocentric (red), authoritative (blue), achiever (orange), consensual (green), integral (yellow), holistic (turquoise), next? (coral). With more people, interconnectivity expands – or needs to. So we learn and adopt better models. It’s also what gives us hope – belief in a better future. With environmental problems and planet limits, our technological and social developments are barely staying ahead of our need to live together, our urge for harmony. Sometimes we fail catastrophically. Plus you never forget those former memes; you incorporate them and add more parts, more skills and choices. You become more fully human. As societies, we are more connected than we possibly imagined. In short, we continually strive for greater harmony. What is greater harmony in cities? We started with caves and we ended in suburbs? Be still my heart! Surely we can improve on that. These one-note communities were just a stop on the way, an orange meme. Sometimes we really blow it, given too much power too soon, a baby with matches. And then we are forced to fix our errors, where the hardest part may be admitting it. Here’s how I see these memes in cities. Beige – caves. Purple – primitive tribal villages. Red – Ancient Greece, Rome. Blue – fortressed cities, castles, cathedrals. Orange – industrialization, skyscrapers, suburbs. Green – new urbanism, sustainable design, revitalization. Yellow – living cities, restorative. Turquoise – adaptive, co-creating, biomimicry. Coral – too soon to know; biogenetics, nano, neurotech, transhumanism, singularity? We are re-calculating, re-examining our lifestyles. How to become more harmonious, to live with seven, eight, or nine billion people? How to be in balance with the planet, to replenish resources rather than deplete them? And how to cultivate quality. How do you love life? How do your clothes, home, city, your tattoos express that and feed your spirit? 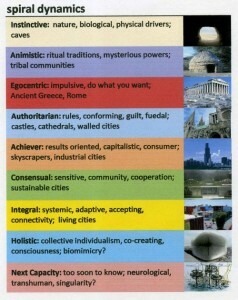 The moderns (not in design, but in thinking) believe in an oppositional blue/orange mindset. My way or no way. Green thinkers want to cooperate, create communities, and build sustainably. Yellows adapt on the fly, see wholes and parts, and are comfortable with constant change, in other words, harmony. Different notes combine to express entirely new sounds while still celebrating you. Our cities need to be that way. I’d say the first harmonious cities will be yellow. Harmony is love and we grow towards it. Not harmony all sugar and sweet, pastoral utopias, but with all the tangs and twists of human nature wound together as separate strands for resilience. It’s the tattooed city, visibly expressing who we are and who we want to be. What color is your city? What’s harmony to you? Images, videos: Thelonious MonkRound About Midnight; CalatravaZubizuri Foot Bridge, Bilbao, Spain; HollNelson-Atkins Museum, Kansas City, USA; Maya LinVietnam Veterans Memorial, Washington DC.